Yes, August, the eighth month of the year is actually here. 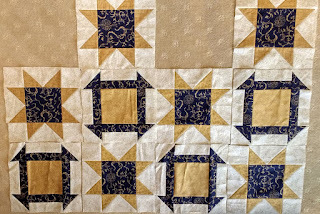 I have posted various quilts along the way, but haven't always managed to post the goal and then the completed quilt in a timely way to link up with Red Letter Quilts, so here goes for August. I have several quilts on the go (what else is new?) and as to what order they will get completed in I'm not entirely sure. 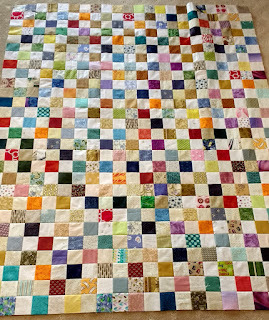 First of all there's the 2 and half inch squares that began as me cutting scraps rather than putting them away - well, we know how addictive that can be! So I have quite a few all sewn up, but having made a 2 inch one of these - (likely to be given away as a baby gift) I realised I might want to keep a reminder of a number of quilts I've made and given away in the past and this could be a nice way to do it. So it may continue to grow yet. Project number 1 - (for now). 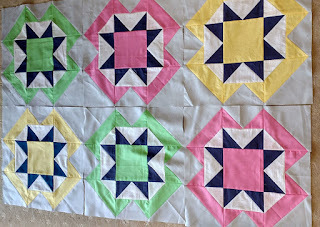 Then there are these Amish type rolling stars that I've actually done half of - just need to stay focused and complete the other ones in varying colours. 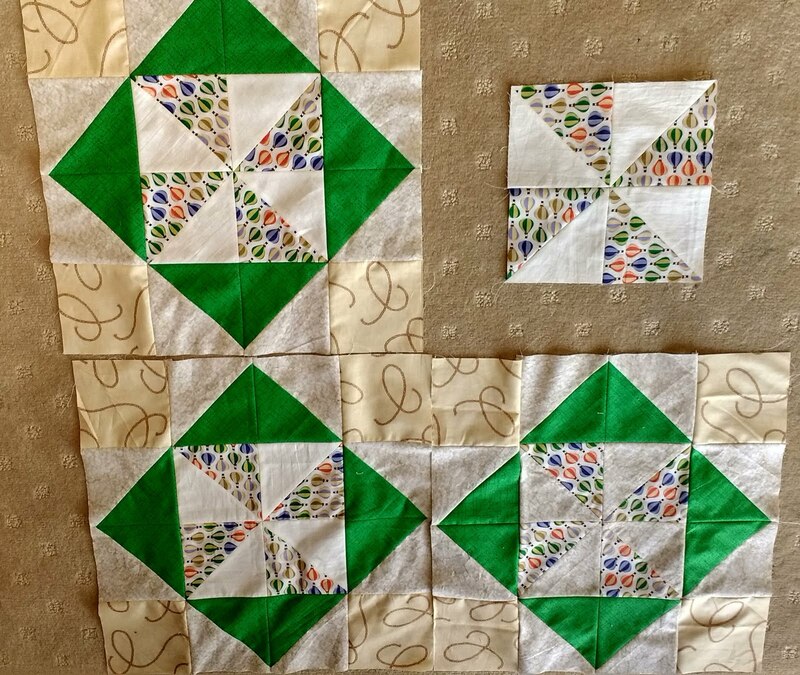 I like how they meet and create more space - Hmm, how will I quilt that? Oh yes, and I've remembered I was going to try another quilt as you go with a very narrow pale grey sashing on this one. Project number 2. The 'balloon' fabric - if you look closely you'll see that multi-coloured fabric is actually little hot air balloons, the one I was trying to match with blue, orange etc fabrics. Well, the one I found is the corners with 'rope' - how fitting is that for a hot air balloon? Needs to be tied down at some point, a bit like Project number 4! Lots of lovely projects. I am working on a postage stamp quilt as a leader/ender project. 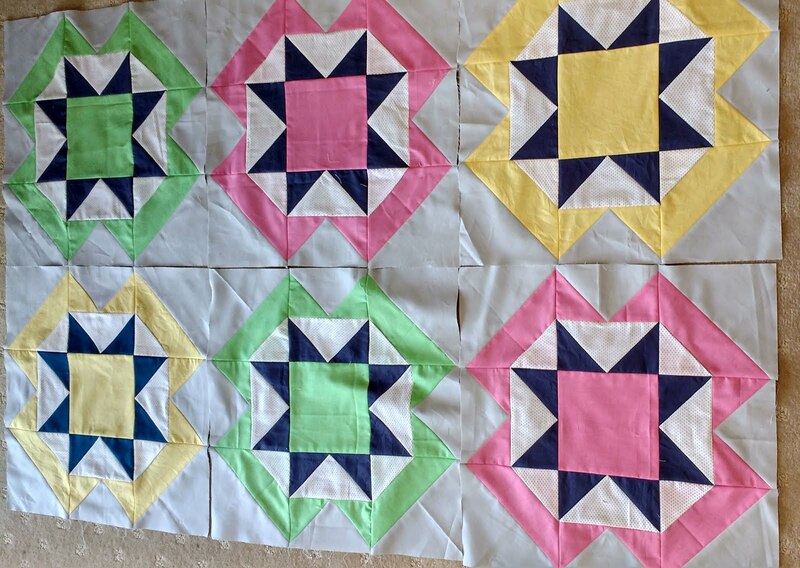 Good luck on completing these quilts in August. Good luck with your OMG plan! 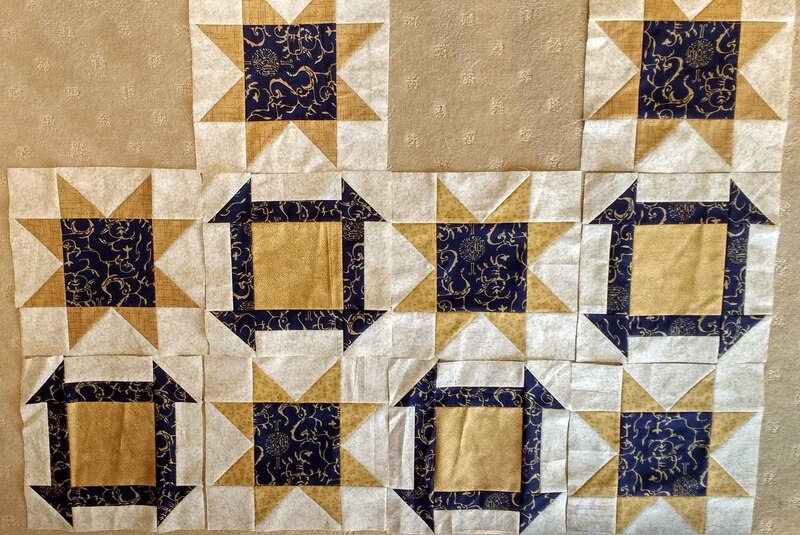 I have several boxes I collect various sized squares in, cut from scraps. I like how you have alternated your color with neutral and lots of contrast. I am tempted now to start sorting mine! Love your postage stamp quilt. Glad to see your progress. It reminds me to post mine! Have a great week.